Dedication: 23 May 2004 by Gordon B. HinckleySite: Less than 1 acre. Exterior Finish: Original brick and columns of meetinghouse dedicated in 1931. Total Floor Area: 25,000 square feet. The Copenhagen Denmark Temple was the first temple built in Denmark and the second built in Scandinavia, following the Stockholm Sweden Temple (1985). 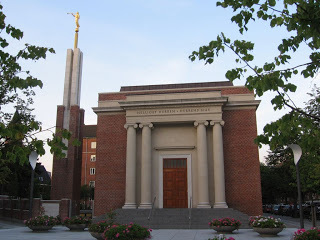 The Copenhagen Denmark Temple was the second temple built from an existing building, following the Vernal Utah Temple (1997). The temple is a total renovation of the neo-classical Priorvej chapel, which was built in 1931 and dedicated by Elder John A. Widtsoe of the Quorum of the Twelve Apostles. The interior was completely gutted, leaving the exterior and a few carefully reproduced portions of the interior as reminders of the original chapel. Construction on the Copenhagen Denmark Temple came to halt not long after renovation began when realizations were made regarding the building’s physical dimensions and the high water table in the area. Plans had to be redrawn, significantly increasing the cost of the temple. The redrawn plans for Copenhagen Denmark Temple included demolition of an existing mission office and garage known as the “villa.” The baptismal font was relocated to a separate underground structure adjacent to the temple and marked with an above-ground glass dome. A similar dome was added to the temple over the Celestial Room. A new meetinghouse, the Nitivej Chapel, was built near the Copenhagen Denmark Temple during the same time the temple was constructed. The chapel served as the starting point for tours during the temple open house. A total of 25,512 visitors toured the Copenhagen Denmark Temple during its two-and-a-half week public open house, resulting in 1,084 missionary referrals. During the open house, an 8-foot replica of Bertel Thorvaldsen’s Christus statue was placed in the chapel entryway for visitors to see. The original statue stands in the Vor Frue Kirke (The Church of Our Lady), just a few minutes away in downtown Copenhagen. At the dedication of the Copenhagen Denmark Temple, President Gordon B. Hinckley spoke of his testimony of eternal life with our loved ones, which had been an anchor to him in dealing with the void of losing his dear wife, Marjorie, who had passed away the month before.